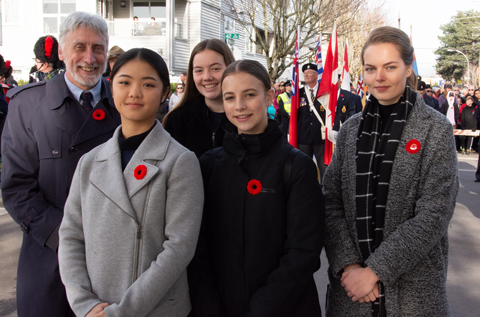 Rotarians from the Rotary Club of Tsawwassen and Interactors from the South Delta Secondary School Interact Club provided service and attended a service to remember those in need and those who served our country and the many who provided the ultimate sacrifice. On the morning of Saturday the 10th, blessed with glorious and unseasonal sunshine, 17 Rotarians and one perennial progeny assembled at Delta Hospital to install the lights in preparation for the coming Christmas season. An annual service to those either living in the Extended Care Unit, those staying in the various hospital wards, those visiting their friends and loved ones and the hard working staff who care for those people, our Rotary Club puts up numerous strings of lights to bring some colour and cheer to the dark days of winter and those who are in, visiting or working at our local hospital. Lights were attached to the railings and trees outside the ECU, to the main entrance of the hospital and inside the healing garden. They will be lit each night from now until January when the Rotarians will return to stake them down for storage until the next year. 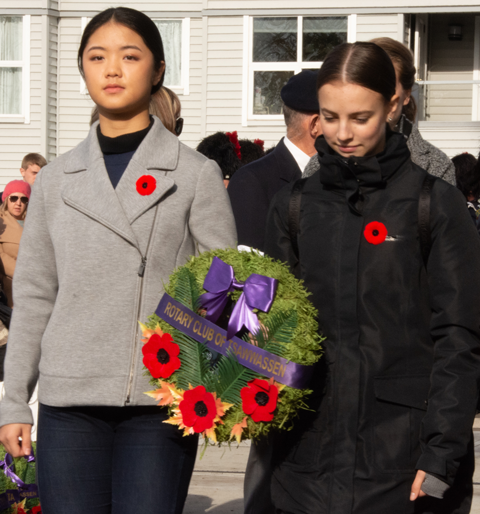 On the morning of Sunday the 11th, as the fog gave way to sunshine, Rotary President Keith, Exchange Student Evel. 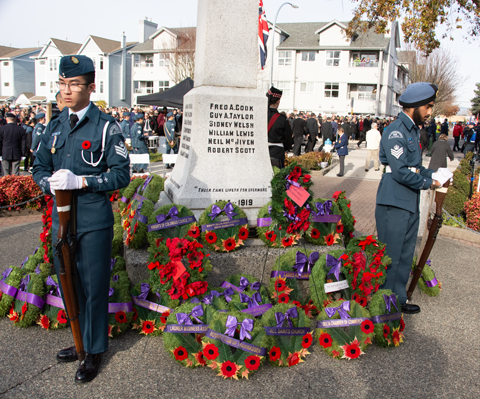 Interact President Ella and Interactors Catrina and Devon attended the Remembrance Day ceremony at the cenotaph in Ladner. 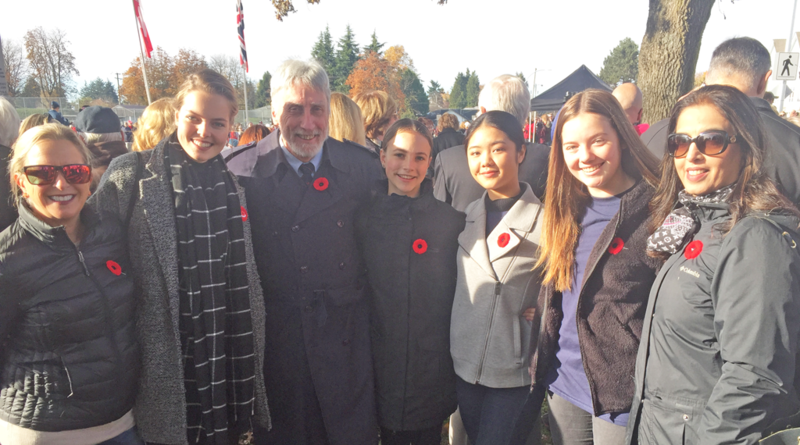 Amongst the thousands who attended to commemorate the 100th anniversary of the signing of the Armistice to end the First World War, The "Great War", the "War To End All Wars" we were also joined by President Elect Gail and the Teacher sponsor for the Interact Club, Ms. Dulay. 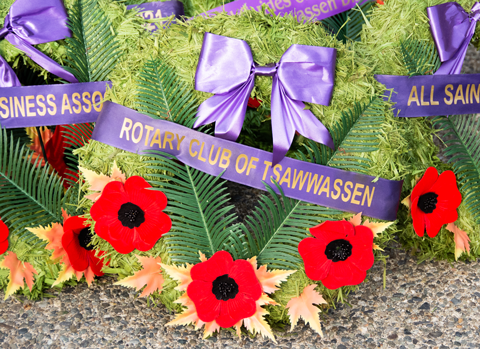 These few pictures tell just a part of the story and we are grateful to Past District Governor and Rotary Club of Ladner member Chris for sharing these images with us. 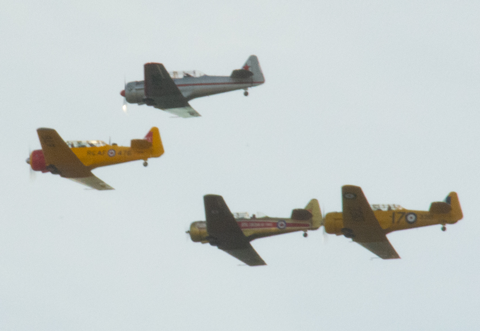 The wreath team from left to right, Keith, Ella, Devon, Cartrina, Evel.